This vehicle was new to Lancaster City Transport and its registration was 128 DTD. After withdrawal it spent a period with OK Motor Services – Bishop Auckland, and used as a Driver Trainer. 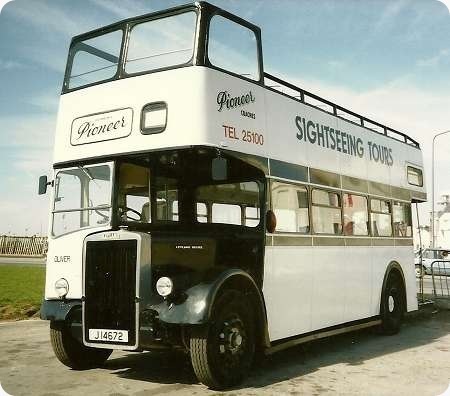 It then spent a period in Preservation with the Cumbria Bus Preservation Group before going to Pioneer Coaches, Jersey, Channel Islands and being converted to an Open Topper for use on Round Island Sightseeing Tours. At a quick glance this could so easily be mistaken for a Leyland body. Only a quick glance, mind you ! Well, well, well, the old girl’s looking good. SCT61 followers will be aware that this was probably my least favourite bus whilst it was with the OK as I’ve often grumbled about it. This was for a number of reasons, one of which being that it was never painted into OK livery but retained its rather washed-out Lancaster colours so never really looked the part. During almost two years with OK, although its main duties were as a driver-trainer, DTD made a number of appearance on service on Summer Saturdays when everything else was out, mainly on Evenwood and mainly, it always seemed, for part of the day on yours truly’s shift! As a result of an attempted – though, thankfully, unsuccessful – serious assault one night it went further down in my estimation. I’m not generally a fan of open-toppers but it looks extremely smart in this livery: not bad for almost 56 years old. 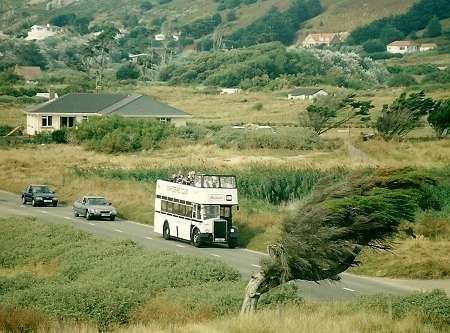 Here is a picture of Pioneer Coaches ‘Oliver’ doing what it was bought to do, carrying a good load of happy holiday makers – upper deck only though – on the Round Island Tour. It is seen here on The Five Mile Road or La Grande Route des Mielles which runs along St Ouen’s Bay to the West of the Island. The protection of the natural landscape has ensured that only limited residential development has occurred along the road. The tree in the foreground and those in the background show clearly which way the wind blows off the Atlantic. There is nothing between this point on Jersey and Newfoundland.